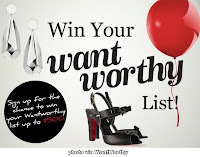 A new shopping site launched called WantWorthy. By signing up for a free account with WantWorthy you can keep track of your online finds in one place. Basically, it is a universal fashion wish list. With just one click WantWorthy allows you to save images, descriptions, links, and notes for items you want to save. To use the site you simply add the "I Want This" button to your toolbar (drag the link WW gives you after signing up to your toolbar and you are all set). When you see items you like you can click the button and it will be added to your WantWorthy account for later view, edit, or purchase. The site is invite-only, but Shoes and Jules readers can sign up using the invite code shoesn01. WantWorthy is currently running a contest where selected users will win up to $500 worth of items from their wish list. To enter all you have to do is sign up and add items to your wish list. The site is great for any shopper who wishes to be more efficient. I think it is also great for fashion bloggers who need to keep track of recent finds. Let WantWorthy make your online shopping experience a little easier. It won't hurt to try it out!